An aneurysm is the simple ballooning of a blood vessel. This can affect the “arteries” or the tubes, which carry “clean” blood as well as the veins (unclean blood). Not only are aneurysms more common in the arteries but also more dangerous. They can either become so big that they can burst…”rupture”, or like an empty dumpster which is a magnet for garbage, an aneurysm collects blood and develops “clots” (garbage). These can then break off and go to the parts beyond or as we say in medical mumbo jumbo “embolize”, from the wind of the blood flowing next to it. Both embolization and rupture are “big” problems. So the goal of treating them is before they become a “problem”. But how do we fix it…. Really two ways to fix a broken road…either repair it or bypass it with a new road. The bypass method involves making a new road “around” the broken ( aneurysm) road. These have been operated upon both by means of open surgery as well as minimally invasive (endovascular / stenting) means. 1. The location of the body – so for instance using stents for behind the knee problems ( such as popliteal aneurysms) involving the blood vessels is not a durable form of repair in the long term – hence open surgery, while a bigger operation, is better. 2. 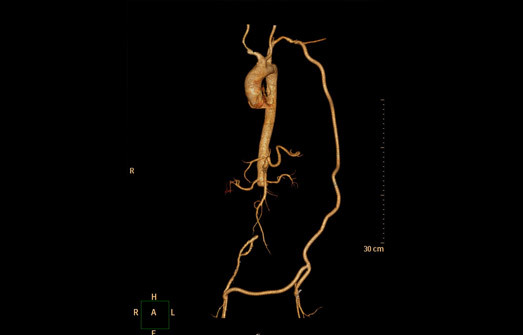 The nature of the blood vessel – abdominal aneurysms in particular require an adequate size of “neck” or upper part of healthy blood vessel – typically 15 mm so as to anchor the stent on normal healthy wall. 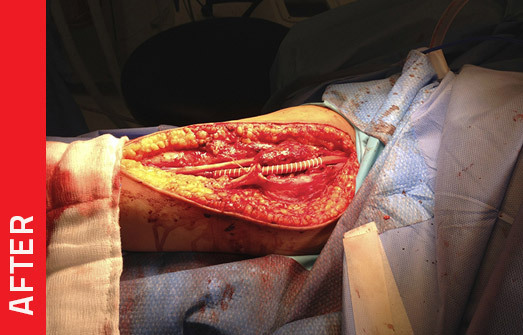 If this is not available, then there are other “make do” methods to manage these, but they have to be compared to the results of open surgery. The goal is to do the best operation possible, given the “clinical condition”. We make every effort to do the procedure through minimally invasive means through the use of stents, and have by far the largest experience with branched and fenestrated stent aortic grafts in the Middle East, given the experience from the training at Cleveland Clinic, Cleveland, USA…. …..but, if it is not in your best long term interest, then we won’t recommend your having this.